Life is full of transitions. As we grow up, we experience changes in schools—grade school, high school, and then maybe off to college. Then life really gets confusing. The global economy often means job changes and relocating. Most of the time, we get married and have children along the way. Many of these changes are great, but others can be quite lonely and tough—divorce, empty nest, health issues, the loss of a parent or spouse are just a few examples. Along the way, how do we hold on to the friends we make—not just the acquaintances, but the deep friendships that help us get through life, both the good times and the bad? We may not be able to keep life from changing, but if we have faith in Christ, we can rely on his promise to supply us with Christian friendships. Are these friendships somehow different? If having a true Christian friend means being one, then how do we do that? 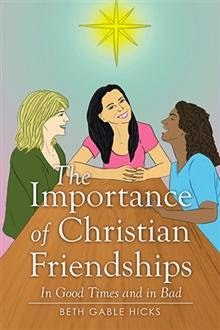 This book explores how Christian friendships are different, or at least should be different, and how we can reach out to others in that friendship. We need never be alone, especially when Christ is at the center of our relationships. Beth Gable Hicks is a member of The Falls Church Anglican in Falls Church, Virginia, and serves on the altar guild and pastoral care teams. A native Kentuckian, she was a political appointee during the administrations of George H. Bush and George W. Bush and is currently the East Coast lead for AllSides, Inc. She earned her BA in business administration from Vanderbilt University and her MPA from George Mason University. She is an active member of the DC DAR, and when she is not traveling or visiting family and friends, she resides in McLean, Virginia. Beth is giving away a $25 Amazon Gift Card! This giveaway begins February 2 and ends on February 13. Winners will be contacted via email on Monday, February 16.